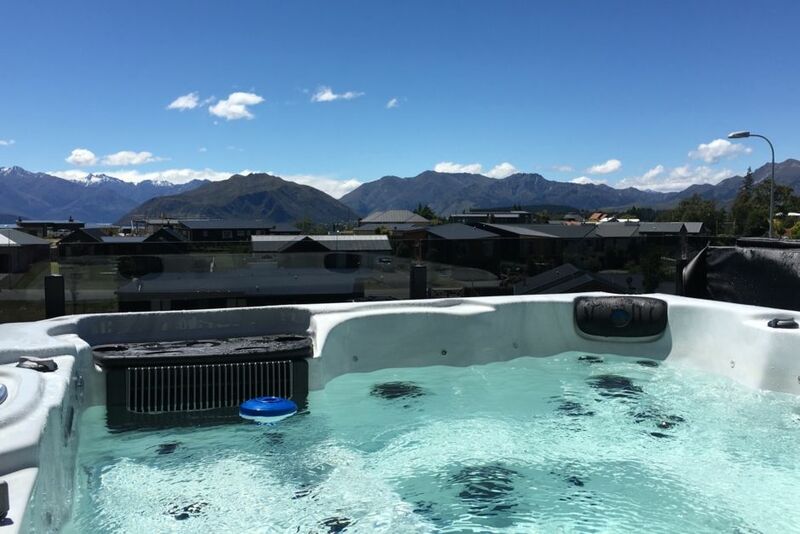 With breathtaking views of the Southern Alps and Lake Wanaka from the elevated deck with spa pool, this modern home offers you luxury without compromise. Architecturally designed and set in a quiet cul de sac easy walking distance to Wanaka's amenities. The spacious open plan lounge is equipped with quality furnishings and modern decor, a large flat screen TV with Freeview, free high speed internet and surround sound. Large ranch sliders open up to a fabulous deck with outdoor lounge suite and spa pool overlooking the lake and mountains. An entertainers kitchen is equipped with new quality appliances, crockery, cutlery and cookware. The master bedroom boasts more mountain views from the king bed and private deck and features an ensuite and large walk in wardrobe. Three more bedrooms on the upper level have a queen bed, 2 kings singles and another with one king single. A fourth bedroom is located on the lower level with private ensuite – perfect for in-laws! This fourth room and ensuite is only available with bookings of 7 or more guests or for an additional fee. All beds are brand new and excellent quality. Both rooms with queen beds have large flat screens with freeview receivers. Very warm in winter, with and large heatpump and wood burner and electric blankets on all beds. The layout of the house is great very practical and spacious. The only thing that lets the place down is the hot water and pressure. The temperature fluctuates between hot and cold too much in the showers especially when anyone else is using any hot water in the house. The pressure fluctuates a lot also when in use by others. The spa also must of been malfunctioning or we didn't know how to use it properly as the jets and bubbles didn't work. Loved our stay here, great location and views and warmth and spaciousness. Only disappointment was the absence of a coffee plunger . Such a great place! Hopefully come back some day. Such a great place! Hopefully come back some day. Great location and beautiful views into the mountains and over the lake. Great kitchen and patio! Great place for families and extended families . Great place for families and extended families . Close to town and the ski fields . Well managed property .